Sow Faucaria seeds in spring or fall because they grow during these months, apart from that, the temperature in March, April, and September are ideal for the germination of the seeds. However, if you do not want to wait until spring or fall, you must create an induced artificial climate of at least 21º C (70º F). 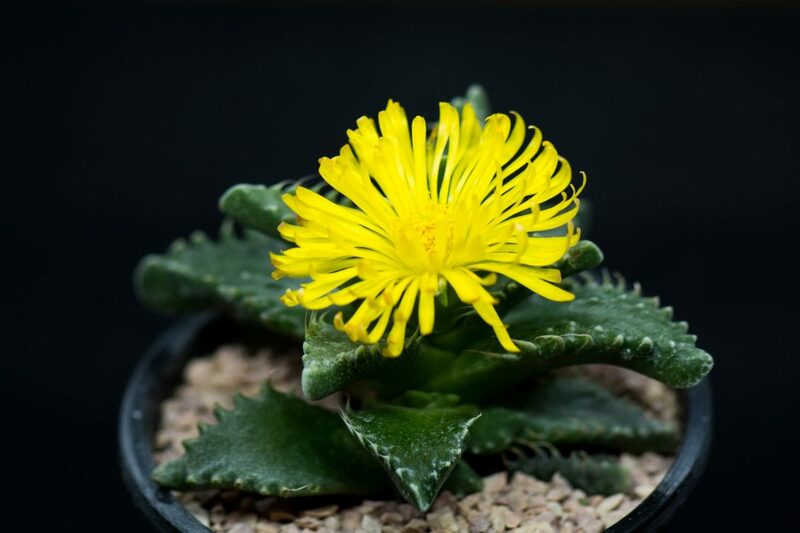 The Faucaria grows very easy, though, it is recommendable that the soil to use should be a combination of pumice and sand to obtain better results. If you are unable to find pumice, try with another organic material, in case you do not find pumice, try with another organic material, use cactus mix (as the last option). Do not forget to sterilize the substrate. An optional step is heating the soil for two hours at 21º C (70º F) and leave it for a week. If you choose to sow the seeds in a seed tray remember you must do double work because you have to transplant later. If you chose a pot, keep in mind that the right one must be small and pan alike. Proceed to fill the pot with the substrate, and moist it. When doing this, remember that the soil must be moist not soaked or wet. Spread the seeds over the substrate and spray them with water. Cover the pot with clear plastic, a white paper, a glass sheet, or with a plastic bag. This process should last seven days. When the seedlings appear, remove the cover and let them enjoy of fresh air. It is vital that you put the little plants in direct sun lights a few minutes every day until they get accustomed to the sunlight. Do not forget to do this gradual, for example, the first week only five minutes then increase the time the next week, and so on. If you don’t do it like that, the seedlings will get burn. Wait some weeks and then, transplant the seedlings to a new pot. Remember to sterilize the new substrate as well as remove the old soil from the roots of the plants. Watering: watering Faucaria plants is not a complicated process, always remember that the key to success with succulents and cactus is on the frequency you water them. They do require water once a week during spring and summer, doing this will guarantee beautiful flowers in fall. It is important to highlight that watering the plants once a week is okay as long as the soil is dry if the substrate isn’t dry, then water. During winter suspend watering, or you will kill them. Light: Faucaria species love direct sunlight, if you can’t provide the needed light to them, a light shadow is a good idea. Besides that, there are certain countries where the sun is quite intense, in those countries the plant should be in a light shadow with good air circulation. When winter arrives, put them in direct sunlight. If your plant is outdoor during winter make sure any rainwater falls on your plant. Fertilizer: apply it only during its growing phase. Applying fertilizer during this time is important because the plant will develop its leaves and flowers better. Use a fertilizer that works with cactus/succulents, and with low nitrogen levels. Propagation: to propagate Faucaria plants is very straightforward because they root quickly. All you have to do is to take a cutting of the plant, let it dry for some days, and semi-bury it on the soil. You may apply rotten hormone to accelerate the process. The temperature must be the mentioned above. Pests and Diseases: This plant will die if you overwater it due to rotten roots, apart from that, the mealybugs and spiders can attack the plant. In case those animals attack your plant, dilute ¼ of light insecticide in a liter of water and spray your plant with it.